Does anyone other than Brownells sell front sights that fit in the slot. I would prefer a straight blade, not anything like the original. Nothing is impossible for the person that does not have to do it. Buy what you want in a larger dovetail size and file down the dovetail-- that's what I had to do. LibertyTreeCollectors.com might have what you need, look under the Swedish parts section. Neat site. Figured that was likely going to be the answer. Guess I had best get the grinder our and make myself a "safe file". I have seen the tall Swedish post replacement sights for sale. And the dovetail is the same. I too hate the Barleycorn sights. Any idea where ya saw them listed? Barleycorn original would not be an issue if they were taller! I'm not sure about that it was probably Brownells but could have been Numrich. Can you measure your existing sight and I can check my parts box and see what I have I may be able to help you out. What type of Mauser are you working on? Before you do that consider simply welding up an original front sight and then filing it to the shape you want. 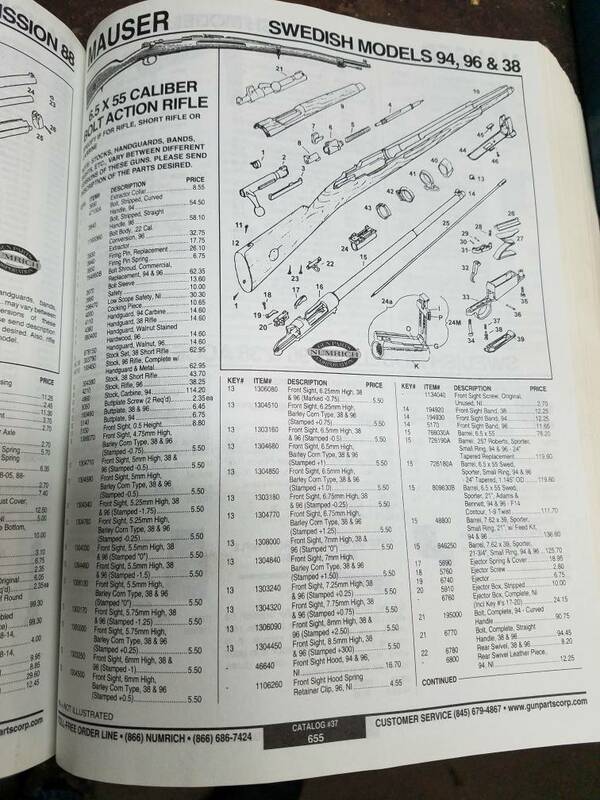 Most old gunshops have plenty of them in their "spare" parts bins. I have done this many times with complete satisfaction. I weld them up so there is plenty of "meat" to file to a taller flat sided "blade" front sight. Tex is also correct about them being carried by Brownell's. Go to www.brownells.com and look for item/inventory # 078-050-000WB Mauser '91 dovetail front sight blank, Hgt. .375. "Fits the Mauser front sight base. Fits most Mausers '91 through '98 rifles with military sight base." I've used these several times in the past and little to no fitting was required. One can take the load they want to use, go to the range, and slowly file down the sight until a zero is accomplished. I know Brownells has them and the shape of theirs is better, but I did not want to pay them 15 bucks and shipping. I looked closer today and the one that is in there is a standard sight that someone had fled down to fit. Guess I am getting LAZY in my old age. Yes, GPC has the kind of price I wanted to see. Need to order several other things to make it worth the effort anyway! Ever see the Chilean 1935 front sight? Diagonal dovetail. Crazy. I ordered 5 of the taller front sights some time ago from Numrich. Didn’t think I’d use all of them, but milsurps grow on you. Don’t think I have any left now.